Newcastle has a history of pioneering leadership in the field of paediatrics. In fact, one of the UK’s first paediatric hospitals, the Fleming Memorial Hospital for Sick Children, opened here in the 1860s. By the late 1890s, we had a second paediatric hospital, the Sanderson Children’s Hospital, where some of the first groundbreaking work in paediatric orthopaedics was carried out. And, in the last century, Sir James Spence – the UK’s first full-time paediatrician – founded the social paediatrics subspecialty, and revolutionised our understanding of child mortality (and much more besides) through the Newcastle Thousand Families Study. 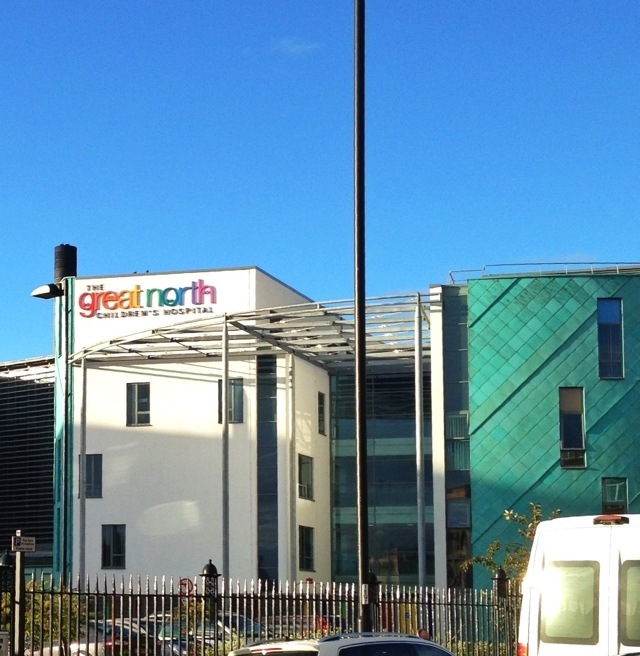 The Great North Children’s Hospital – of which this is a particularly bad photo – is a £100m development opened in 2010. It is but the next step in this illustrious journey. It’s designed to be as un-hospital like as possible, even including a teenage “penthouse” on the top floor, with a pool table, massive flat screen TV, and some of the best views in the city. It also has unrivalled medical facilities, of course, including a genuinely world-leading “bubble unit” for kids with severe immunity problems. Who knows what the next step will be? This 1,838th post was filed under: Health, Photo-a-day 2012, Medicine, Newcastle-upon-Tyne.